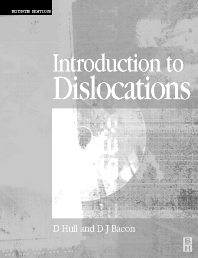 Introduction to Dislocations was first published in 1965 in a series aimed at undergraduate and postgraduate students in metallurgy and materials science and related disciplines. At the time, the subject was maturing and it was expected that 'dislocation concepts' would remain a core discipline for a very long time. As expected, the book has been, and remains, an important undergraduate text all over the world. A wider range of materials has emerged since 1965, most notably in the field of electronics and micro-engineering. The principles of dislocation theory still apply but some of the detail requires further treatment. This fourth edition provides an essential basis for an understanding of many of the physical and mechanical properties of crystalline solids. This new edition has been extensively revised and updated to reflect developments in the understanding of the subject, whilst retaining the clarity and comprehensibility of the previous editions.